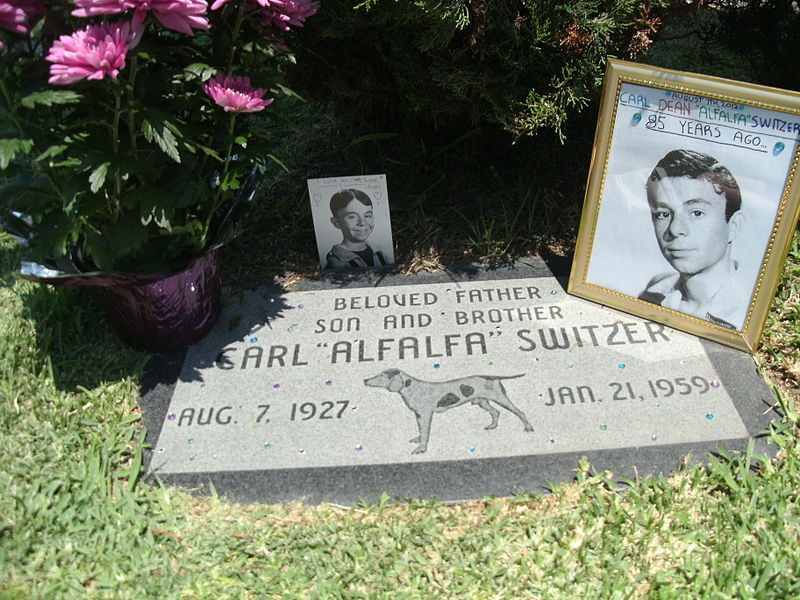 Carl Switzer was best known as Alfalfa, the freckled-faced character with the uncontrollable cowlick from the popular Hal Roach “Our Gang” films. Switzer joined the cast when he was seven years old, and appeared in over 75 of the classic shorts. When television rolled around and “Our Gang” began showing on T.V. as “The Little Rascals,” no one had considered the concepts of syndication or royalties. Most had believed television would prove to be no more than a passing fad. So Switzer had plenty of fame, but not a dime to show for it. As an adult, Switzer played small roles in an number of movies such as “Going My Way,” “It’s a Wonderful Life,” “Favorite Blonde,” and “State of the Union,” but he was also working as a bartender and a bear hunting guide to pay the bills. Before one of his hunting trips, he borrowed a hunting dog from a friend of his named Moses “Bud” Stiltz. The dog went missing during the hunting expedition, and Switzer put up a $50 reward for anyone returning it. A few days later, a man showed up at the bar Switzer worked at with the dog in tow. Switzer paid the man the $50 dollar reward and threw in $15 of free drinks on the house. After a hard night of drinking a few nights later, Switzer got it into his head that Stiltz, the dog’s owner, should repay him the reward money he had to shell out for losing Stiltz’s dog. This is our first clue it probably won’t end well. A totally loaded Switzer and his buddy Jack Piott headed over to Stiltz’s house to demand that $50. Once they arrived, Switzer and Stiltz got into a heated argument that escalated very quickly. Switzer demanded to be repaid the reward money, and Stiltz told him he was crazy. Switzer allegedly hit Stiltz in the head with a heavy lamp, after which Stiltz retreated into his bedroom. At least, that’s the official story. The stepson of Stiltz, Ray Corrigan, reported a different version and claimed his stepfather lied to the police about what happened. Corrigan said during the struggle over the gun, it went off and shot into the ceiling. Corrigan then was running out the door when he heard another shot and turned around to see that Switzer had been shot. He also reported the supposed “hunting knife” that Switzer had tried to attack Stiltz with was a mere pen knife that was closed when Switzer was shot. He went on to say that after shooting Switzer, Stiltz advanced on Jack Piott giving the impression he was going to shoot him too, all the while Piott was begging for his life; the approaching police sirens caused Stiltz to stop. Corrigan told all this to the authorities, but was never asked to testify nor was his testimony used, despite the fact that he witnessed the event. 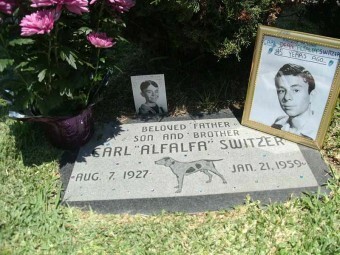 Carl was buried at Hollywood Memorial Park. There is a dog on his grave marker that many suppose to be a likeness of Petey, the mutt from all the “Our Gang” shorts, but others believe it represents Carl’s longstanding interest in hunting and hunting dogs. The first full-length biography of Carl “Alfalfa” Switzer is currently in the works by author James Zeruk, Jr.
Great article! Poor Alfalfa..sounds like a rotten ending!